Ultimax Performance Belts | ATV UTV SXS Belts, Snowmobile Belts | Performance Driven. Performance Proven. NEW ULTIMAX XP EXTREME PERFORMANCE BELT! Engineered for use on high powered UTV and Side-by-Side vehicles and backed by an unprecedented 3-year warranty. MAXIMIZE PERFORMANCE WITH ULTIMAX BELTS! 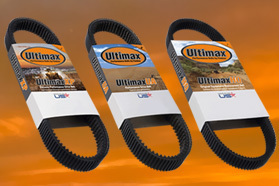 Ultimax belts by Timken deliver optimum performance and longer belt life. Which Ultimax belt do I need? Quickly and easily find the correct Ultimax part number for your machine with our "Belt Finder" tool. Where can I buy Ultimax belts? Find an Ultimax dealer near you. Check out our videos on how to install drive belts. The Ultimax tradition of quality and innovation continues. Everything about an Ultimax belt is designed to deliver performance and dependability. With specially formulated rubber compounds and extra strong aramid cord, Ultimax is designed for the rider who refuses to settle for second best! Proudly made in the USA, the Ultimax family includes Ultimax MAX, Ultimax PRO and Ultimax XS snowmobile drive belts; Ultimax HQ, Ultimax UA and Ultimax XP drive belts for ATVs, UTVs and SxSs; and Ultimax MD (Multi-Duty) belts. 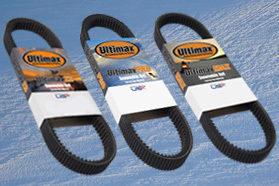 Introducing the ultimate drive belt, Ultimax XP. Uniquely engineered for added strength, reliability and belt life, Ultimax XP belts are designed for extreme performance on today’s high-powered side-by-side vehicles. © 2019 The Timken Company.